Some universities could be doing a much better job enrolling and graduating low-income students. Higher education is a crucial pathway to social and economic mobility at a time when income inequality has reached record levels. Yet many of the public universities that should be helping students move forward are instead holding them back by failing to enroll enough low-income undergraduates. As a result, tens of thousands of young people are missing the first, critical step toward opportunity. Which institutions could be doing a better job of enrolling and graduating more low-income students? 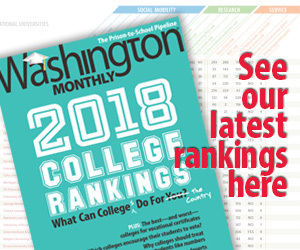 The answer to that question, it turns out, can be derived from data in the Washington Monthly’s own rankings. Those rankings include a “predicted Pell enrollment rate” measure. This statistic compares the percentage of students enrolled at a given college who receive a federal Pell Grant to the percentage who would be statistically expected to enroll, given the college’s selectivity. Importantly, this calculation does not suggest that every selective college must enroll huge proportions of low-income students—only as many as other, academically similar colleges have already enrolled. We took that predicted Pell enrollment rate for each institution, compared it to the institution’s actual Pell enrollment rate, and applied the college’s graduation rate. This allowed us to estimate how many additional Pell students a particular college could graduate without changing its admissions standards—in other words, the college’s “fair share” of qualified, low-income students. Table 1 shows the ten universities with the largest potential to graduate far more Pell recipients, based on this measure. For example, Pennsylvania State University’s main campus alone graduates about 930 fewer low-income students every year than our formula suggests it could. The University of Delaware, Indiana University-Bloomington, the University of Alabama, and Purdue University each have shortfalls of more than 400 low-income students. By opening their doors to more low-income students who qualify academically, these colleges with Pell enrollment deficits could make a significant dent in helping the 240,000 high-achieving, low-income students who, according to the Georgetown University Center on Education and the Workforce, do not graduate from college each year. This finding holds even though some low-income students would enroll and graduate elsewhere. Studies show that similarly qualified low-income students are much more likely to graduate from a selective college than from an open-access institution. Why, then, are some universities enrolling so few low-income students? We decided to ask them directly. Their answers provide a glimpse into the organizational dilemmas of these institutions that are missing the mark on one of their most vital public obligations. An administrator in charge of undergraduate education at Penn State noted in an email that the main campus is part of a larger system of twenty campuses that serve students’ differing “financial circumstances and academic interests.” Partially because of the lower costs, many low-income students enroll at the branch campuses, he added. Indeed, University Park is the most expensive campus in the Penn State system, charging low-income students about $18,000 per year after grant aid (including Pell Grants). It could choose otherwise. Table 2 shows the ten universities that increased Pell enrollment rates, enrolled more Pell students than predicted, and maintained better than average graduation and default rates. The University of California, Santa Barbara, for example, is in the top echelon of its state’s universities, serving students of variable income and ability. Yet 38 percent of Santa Barbara students are low income, compared to only 15 percent at Penn State, and Santa Barbara charges low-income students about half as much. If more universities made similar choices, far more high-achieving, low-income students would stand a fighting chance of earning the college credentials they need. Mamie Voight and Colleen Campbell teamed up for this article. Mamie Voight is the director of policy research at the Institute for Higher Education Policy. Colleen Campbell is a senior policy analyst at the Association of Community College Trustees.